Kevin Hillstrom: MineThatData: A New Product: The MineThatData Elite Program - Featuring The MineThatData Elite Productivity Index! A New Product: The MineThatData Elite Program - Featuring The MineThatData Elite Productivity Index! The reason our business isn't performing well is because of the economy - it's not our fault. Can you tell me how other companies are performing? Do you have an inexpensive starter product that gives a lot of value? It's time to solve this problem. Today, I am announcing a new program, and the first product from the new program. 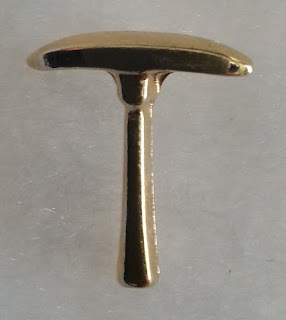 Program = The MineThatData Elite Program. 1st Product = The MineThatData Elite Productivity Index (MEPI). The MineThatData Elite Program is a subscription-based program designed to give you valuable merchandise productivity information about your business, while offering a view of how all Elite Program participants are performing, on average. What is the MineThatData Elite Program, and how does it work? 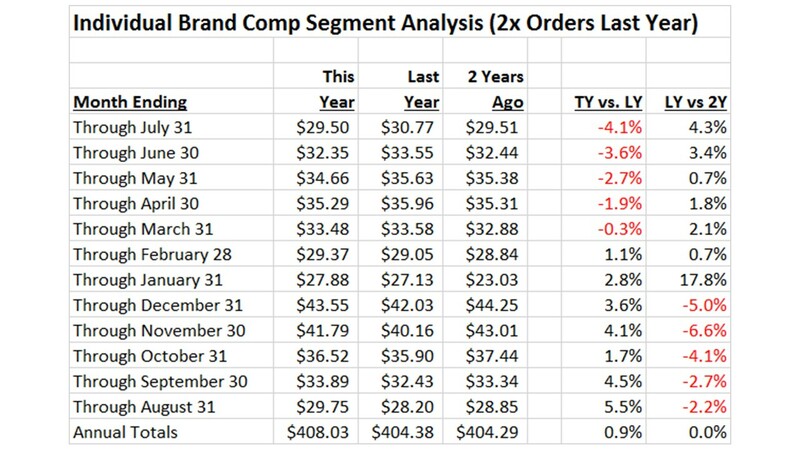 First, you get a comp segment analysis, by month, for each of the past two years. I will clearly communicate your "Merchandise Productivity" ... by measuring customers with exactly two purchases (omitting the impact of recently acquired customers and the impact of loyal buyers who are influenced by loyalty initiatives). This analysis has been run for over fifty brands during the past three years - the methodology determines overall merchandise health. If your merchandise isn't productive, your marketing will not be productive. Your merchandise assortment is the reason you are successful. Merchandise productivity is the least understood concept across our industry - almost nobody understands the role merchandise plays in marketing productivity. That is going to change. You can clearly see when the business struggled (beginning March 1 of this year), and when the business thrived (January of 2014 through February of 2015). It will be your job to figure out what happened (or you can hire me for a Merchandise Forensics project, and we'll drill down further). You will also receive a count of New + Reactivated buyers by month (i.e. no prior purchase in the past twelve months, but a purchase in the current month). This will tell you how you are managing the New + Reactivated side of your business. 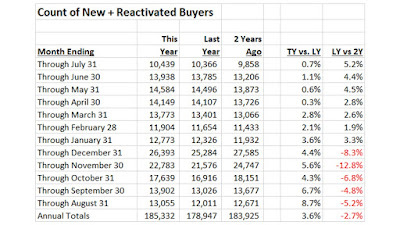 New+Reactivated buyer metrics are the second most important activity to track. 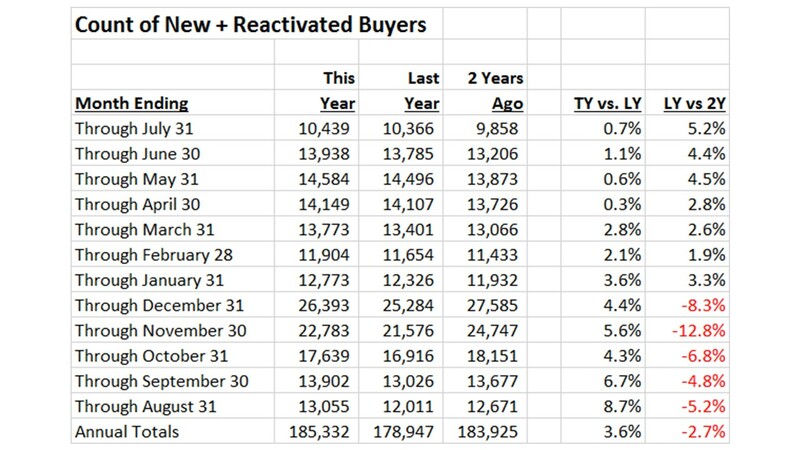 Here, we can see that this business is offsetting comp segment declines with increases in New + Reactivated buyer counts. In essence, this business is papering over productivity declines by finding new customers. Ok, that's how you are performing. Now, you tell me that you want to know how other companies are performing. Here's what I will do. I will average the percentage change columns for the two tables above, across MineThatData Elite participants. This will give us a sense of how you are performing against the overall Elite population. The overall average will be called "MEPI", or the "MineThatData Elite Productivity Index". This is telling, isn't it? Elite participants are exhibiting performance that is, quite honestly, opposite of how the brand above performed. This would tell us that the brand above is having unique challenges that need to be addressed. 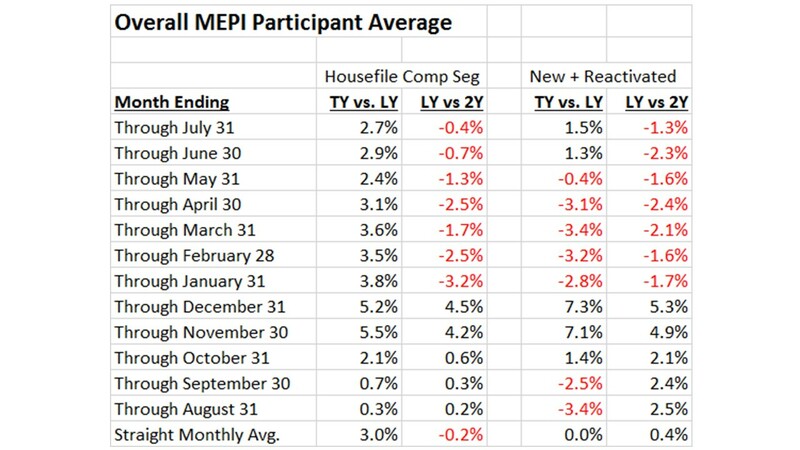 We can see that the "MEPI" for housefile is +3.0%, and in recent months has trended positive. We can see that the "MEPI" for New + Reactivated buyers is flat in the past year, and has not trended well in recent months. Only those who participate in the Elite Program get to see the results. No sharing with anybody else. 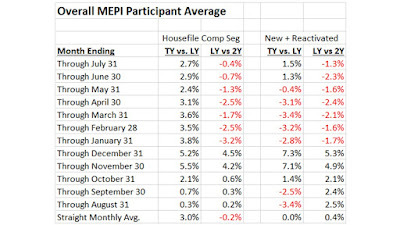 Every participant gets to see the Overall MEPI Participant Average outcome, by month. Nobody gets to see specifics regarding how other brands perform. You only get your results, and overall averaged results. Many of you want to know how you stack up against the competition. As we build the client base, you'll have a robust comparison ... and if we really bulk up the client base, then I will be able to split the results by business type (Apparel, Home, Gifts, B2B, B2C, etc.). I want only bare-bones data, folks. The dataset you send me will have just four columns. The dataset must be in .csv format, or the data will be rejected. The data must be formatted as follows. Column 1 = Household_ID or Customer_ID, the id you use to track customer behavior. Column 2 = Order Date ... must be in YYYYMMDD format (i.e. 20150809). This is the only acceptable format, for the purposes of this inexpensive product. 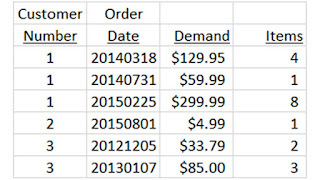 Column 3 = Demand Total in the Order ... formatted in numeric format (i.e. 24.99 for an item that the customer paid 24.99 for). The column should represent what the customer paid for the item. Column 4 = Items in the Order ... formatted in numeric format (i.e. 3 for three items). The column should represent the number of items the customer purchased. 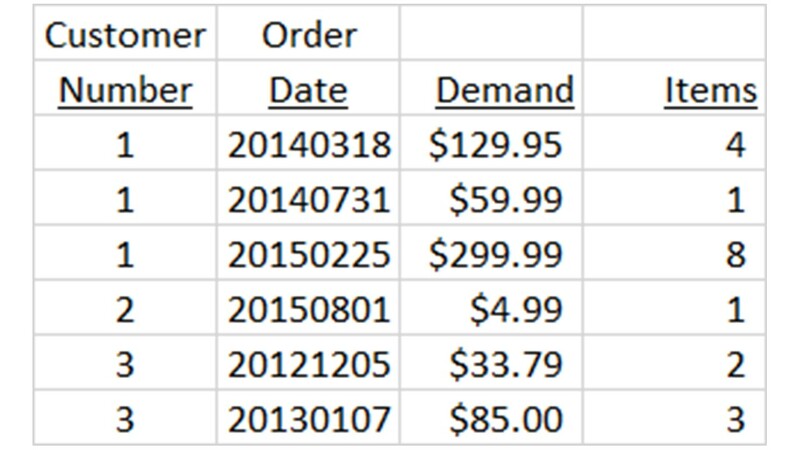 The dataset / .csv file should have one row for all demand spent by a customer on a given date ... in other words, if the customer purchased 3 items for $14.99 each on August 9, 2015 ... then I need to have one row in the dataset for that order, and that row has a value of $44.97 in the demand column. Any existing client or loyal blog reader who joins on or before August 20 will pay $1,000 three time a year ($3,000 per year). Everybody who joins after August 20 will pay more ... $2,000 three times per year ($6,000 per year). Everybody who joins after January 31, 2016 will pay $2,500 three times per year ($7,500 per year). In other words, make sure you participate immediately. You can opt-out at any time and hop back in at any time ... this is a handshake agreement, you're not forced to participate. I plan on having three analysis windows per year, loosely mirroring business seasons. Analysis Window #1 = June 1 to September 30 (Summer). Send three years of purchase data and payment prior to October 15. Analysis complete on or before October 31. Analysis Window #2 = October 1 to January 31 (Christmas). Send three years of purchase data and payment prior to February 15. Analysis complete on or before February 28. Analysis Window #3 = February 1 to May 31 (Spring). Send three years of purchase data and payment prior to June 15. Analysis complete on or before June 30. Only DIRECT CHANNEL transactions are to be included. No retail. Retail transactions are heavily influenced by in-store capture rates. This is meant to be an index that measures DIRECT CHANNEL (call center + e-commerce + mobile) merchandise productivity. I know, you want to understand the small print. For you, I present "Large Print". I reserve the right to partner with one (1) vendor to complete the work, should the amount of work become onerous. For instance, if we had 500 companies sign up to participate, I'll need help. You need to know this ahead of time, and I will announce selection of the vendor chosen to sponsor the process, should the workload become too great. I also reserve the right to terminate the program at any time, or to sell the program at any time. $1,000 once-every-four months, pre-paid, for all subscribers joining prior to or on 8/20/2015. $2,000 once-every-four months, pre-paid, for all subscribers joining after 8/20/2015 but prior to 2/1/2016. $2,500 once-every-four months, pre-paid, for all subscribers joining after on or after 2/1/2016. If your brand is part of a holding company, standard pricing will apply to the first four brands that participate. 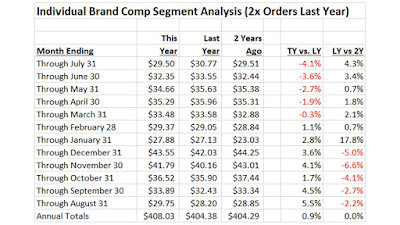 If you have 20 brands, then your fees will be capped at four brands, though all twenty brands will be analyzed. File format must conform to the file structure illustrated above, and must include only direct-channel transactions. No exceptions. The three tables outlined above are the minimum deliverable. I reserve the right to add additional tables, charts, analytics, and written thoughts at no additional charge. In the event the workload becomes overwhelming and I have to work with an outside vendor, the outside vendor will see the results, but will not be allowed to share the results. In the event that I sell the program and/or retire, the rules of the program may be changed by the organization who takes over the program. All data must be received on or before the 10/15, 2/15, and 6/15 deadlines, and must contain exactly three years of data through 10/1, 2/1, and 6/1, or your information will not be included in the analysis. I will sign a confidentiality / non-disclosure agreement only on the condition that the agreement only pertains to this single product, and that all text outlined in the large print section is included in your confidentiality / non-disclosure agreement. I reserve the right to sub-divide / segment the data, in the event that a sufficient Elite membership base exists. For instance, if there were 200 participants, and 50 of the participants were Apparel businesses, the Apparel businesses may want their own index. I reserve the right to sub-divide / segment the data accordingly. What would stop you from spending $3,000 a year for all of this information? If the program does well, then I anticipate setting up "MineThatData Elite" sessions from time to time - one-day conferences where Elite members only will gather and discuss important topics. Sound good? You also get my phone number. Have a question about anything? Call me. Just as good, you get my thoughts on where all of this information is taking us, going forward. You are working with a person who possesses nearly thirty years of professional experience. That counts for something. As a charter member of The MineThatData Elite Program, you will receive the highly coveted MineThatData Pick Axe Pin!! When you attend NEMOA or Internet Retailer or Shop.org, you'll wear your pin with pride ... and when somebody asks you what the heck you are wearing, you will let them know that this is an elite perk (worth all of $1.20, but don't share that fact with anybody) that separates you from the competition ... you will know more about how the industry is performing than your peers at other brands. You will be the expert - all because you participate in the MineThatData Elite Program. Again, what would stop you from spending $3,000 a year for all of this information? You have a one week invitation to get in at the introductory price. This price only applies to existing clients and long-time blog readers. The offer ends at 11:59pm PDT on August 20. Contact me immediately (kevinh@minethatdata.com) to receive your invitation into The MineThatData Elite Program! !